Essentially a home-theater-in-a-box minus the speakers, Samsung's new HW-D7000 combines an A/V receiver and a 3D-capable Blu-ray player in one box. Add in Samsung's Smart Hub--which includes video- and music-on-demand, AllShare/DLNA media streaming, and an apps store that lets you add a variety of services--and you've got yourself one full-fledged media center for $599.99. Heck, Samsung even throws in an iPod/iPhone dock for good measure. 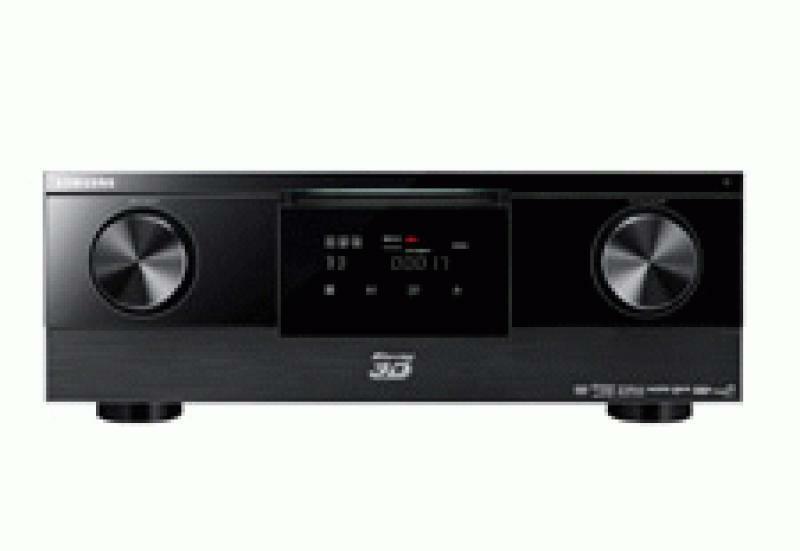 • Read more AV Receiver reviews from HomeTheaterReview.com's staff. • See more Blu-ray players in our Blu-ray Player Review section. • Find an LED HDTV or Plasma HDTV to pair with the HW-D7000. Given its price point, the HW-D7000 has a healthy features list in both the receiver and Blu-ray camps. On the receiver side, this is a 7.2-channel model, with dual subwoofer outputs and 840 total watts of power (120 watts per channel). The connection panel includes four HDMI inputs and one HDMI output; two component video ins and one out; four composite video ins and one out; four digital audio ins (three optical, one coaxial) and five stereo analog ins; and speaker terminals that accept bare wire, spade lugs, or banana plugs. The HW-D7000 will convert all analog sources for 1080p output over HDMI, or you can configure it to bypass the upconversion and just perform analog-to-digital conversion. The back panel sports a LAN port for network connectivity, but the HW-D7000 also has built-in WiFi if you prefer to go the wireless route. All of the important audio decoders are here, including Dolby TrueHD, DTS-HD Master Audio, and DPLIIx. Samsung offers an automatic setup tool called MRC (Musical Room Calibration) to help set speaker level, size, and distance using a supplied microphone. This tool does not perform the more advanced room equalization that you find in many higher-end receivers. You can also manually set the speakers, with crossover options from 60 to 200Hz. You can designate whether the surround back speakers are located behind the listening area or in the front, as the front height speakers in a DPLIIz setup; if you don't have surround back speakers, you can also use these channels to bi-amp your main speakers. The HW-D7000 does not offer second-zone audio capability. Additional audio tools include an MP3 Enhancer to improve the quality of compressed sources, Audio Return Channel to receive audio via HDMI 1.4 from your TV, and Smart Volume to minimize level variations. On the Blu-ray side, the integrated player supports the Blu-ray 3D, Blu-ray, DVD, CD audio, MP3, WMA, Divx HD, and JPEG formats. 2D-to-3D conversion is available. The player has 1GB of onboard memory for storage of BD-Live content, and the front panel includes a USB port that allows you to add more storage (this port also supports media playback). The player includes Samsung's new BD-Wise feature; when connected to a compatible Samsung display, you can configure the player to output discs at their native resolution and let the display handle the resolution- and frame-rate conversion. I liked the clean look of the HW-D7000's front face. Two large dials for volume and input selection flank a large display that offers information on source, sound mode, and speaker usage. The display also includes four touch-capacitance buttons for stop, play, select, and eject. Hit the eject button, and the entire display board moves down to reveal the slot for the disc player. Along the bottom of the front panel, you get numerous buttons for menu, navigation, audio tools, FM tuning, and more. All of these buttons are hidden behind a drop-down panel with a brushed-aluminum finish that adds a hint of elegance. One of the dangers of housing multiple components in a single chassis is that, if the system is not intuitively designed, the device can be complicated to set up and use. That's not a problem with the HW-D7000, thanks to an excellent user interface that seamlessly blends receiver and media-player functions into one clean, colorful menu. You can navigate content either by device or type, the Settings section logically arranges your video and audio setup tools, and the Internet icon grants you access to Netflix, VUDU, Hulu Plus, Pandora, CinemaNow, Facebook, and more. Unfortunately, the supplied remote control isn't quite as intuitive. To keep the remote's form factor small, some buttons share functions, requiring you to press a Shift key to change the functionality. The Blu-ray buttons are logically grouped together near the center of the remote, but the audio functions are scattered about. You do get direct buttons for Netflix and the Smart Hub, which is a plus. The controller lacks backlighting (the transport controls glow in the dark), as well as a dedicated QWERTY keyboard for easier text input. However, Android and iPhone users can download a controller app that includes a virtual keyboard. Read more about the HW-D7000's performance on Page 2.